Headlines: The fishing continues to be very good even though some have found that it may have slowed a little on Lake Eucumbene. Others have had their best sessions ever! Rainbows have been the main target with a few more browns starting to show. River fishing has also been very good for those that have managed to drag themselves away from the lake. Once again to the ignorant minority who visit the lake, Please don't treat the area like a tip. Please take your rubbish home or bin it on the way. Some areas of the lake have been left looking like a dump. Come on! If you can take it in you can take it out just as easily it is not that hard. Rivers:- Not a lot of change in the river fishing other than to say it is very goods with plenty of hoppers to give good daytime searching and good evening rises. 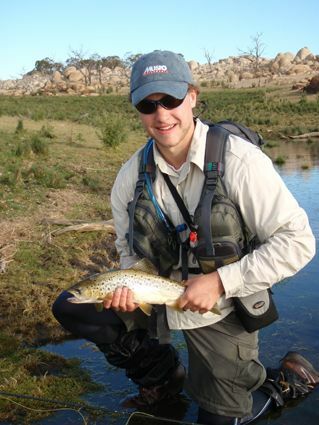 Dry fly fishing has been good right through the day with some nice browns to be found in the Eucumbene and Thredbo. Dry flies to use at the moment are small emergers like Klinkhamers, Blue wing olive parachutes, attractors like Wullfs and Stimulators, along with beetles and hoppers. A nymph suspended under the dry during the day is a good method to use, but a dry at dusk will have best results. 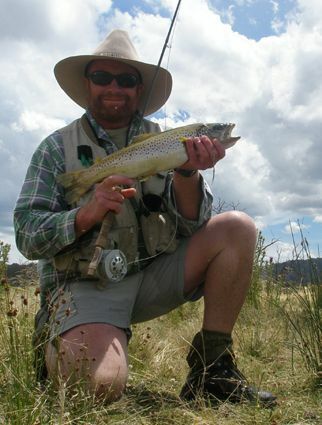 Other rivers to fish are the Moonbah, Snowy, Gungarlin, and a few other smaller high country creeks. Lake Eucumbene:- The lake is offically firing. and I don't think we have spoken to an angler that has blanked for three weeks! There are plenty of stories of the "best ever sessions" or "like it was in the eighties" being told by many seasoned anglers. Reports of great fishing around the edges are still flooding in with literally cricket score catches. 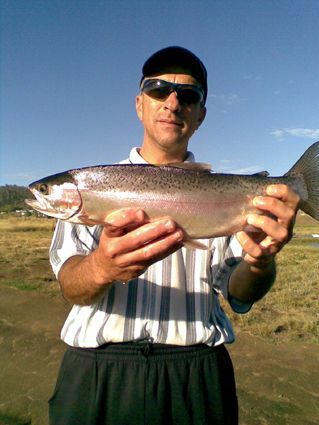 Daytime fishing has been spectacular with plenty of nice rainbows searching the edges along with a few browns. Midges and caddis have been the main insects hatching but there all sorts of food being taken by the fish. Snails, corixa, damsels, beetles, mudeyes, tadpoles, daphnia and hoppers have all been on the menu. Hopper fishing has started to produce some nice day time fish. Berleying with live hoppers is the key and this can get some fantastic action during the hotter parts of the day. Some areas have seen a few mudeye hatches of an evening and these should get progressively bigger as the month continues. Shallower weedy, grassy soaks have been the best areas along with some of the deeper banks next to the soaks. Thistles have been causing a few bust offs in some areas but most anglers are putting up with losing a few as there are plenty of fish working in these areas. *Had another arvo session myself last week for ten good rainbows, nine on beadhead nymphs and one on a Taihape Tickler. The better fish were on the chew while the sun was still up. On dark the fish were notably smaller. That session made it 54 fish in four sessions. Certainly my best fishing ever on the lake. Callum Musto managed one fish Friday night before the easterly blew the evening away. Looking for a different approach on Saturday morning and with a few fish rising those fish we caught were on dries, and all browns. Even Ian Musto a self declared fishing pariah got fish on Saturday morning. The storms put an end to Saturday evening though another brown was jagged on the dry. Sunday was hard work with few fish moving and storms building and a couple of rainbows taken. Talking to others fishing the lake it appeared that the pace has slowed a little but the fish are still there if you put the time and effort in. *Stuart Sturgeon reports, Went out Thursday night and had what was my best session in a while, catching twelve good fish on beadhead nymphs and midge balls. Had another hit on Saturday with Craig out of the boat and fished hard, I caught two out from Buckenderra then went to around near Crowes and picked up four each including the brown, all mine on a bead head nymph and Craig used a woolly bugger. Went out again Sunday arvo and brained them, caught fifteen and all good fish. Again all on the bead head except for the last fish after dark which ate a woolly bugger. Just before and just after a storm the fish would go nuts, should have caught forty odd if the hits connected. three day trip which was gave us awsome fishing like you said it would. We caught them on black nymphs weighted and unweighted, taihapes, midge balls, and grass hoppers, my brother also cleaned up on a fairly large fuzzy wuzzy. We caught maybe five hundred grass hoppers and threw them where the fish were rising, got the fish taking them off the surface and then cast a hopper to them. They got smashed. Biggest was only a 3.5lbs brown but a nice fish anyway. 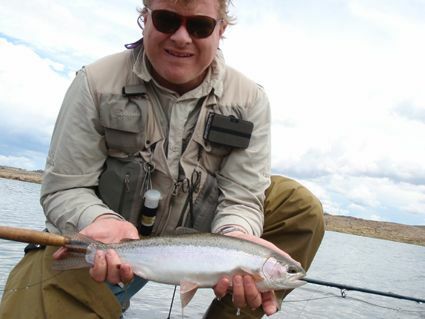 Those bloody 2 lbs rainbows hit like steam trains and we got snapped off on several occasions. 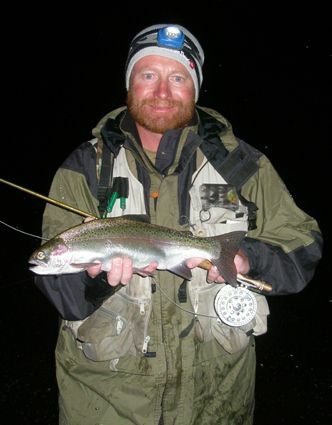 Night fishing has been a little better with some good rainbows still poking around but the afternoons are still the best with early mornings being the second best time to be out on the water. 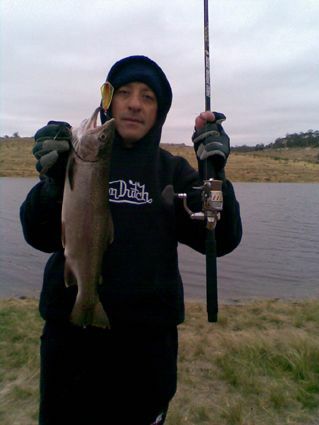 Lake Tantangara :- Lots of small fish with a few better ones thrown in has been the standard fare at Tantangara. Providing some fun for beginners and experienced alike. We now have Sting Cobras back in stock. Our Rapala Minnow indent has just arrived with trout patterns from 1cm to 11cm. New Bushy's Stiffy Devilfish Vibes are in stock. 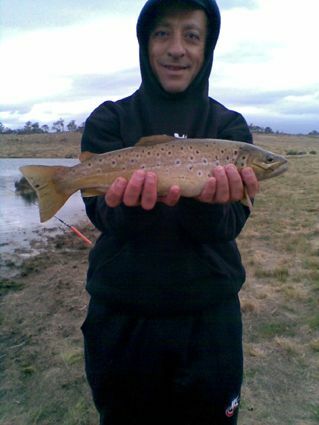 Eucumbene:- Trolling has been good with some excellent reports coming in. All types of methods have worked with downrigging, flat lines and lead core. Anglers have still been taking their bags of quality fish with little effort overall. Have to be happy with that. White rocks, Buckenderra and Cobrabald areas have been very good. Top water lures like Tassies and small shallow minnows have been the best overall but there are some good fish being caught deeper too. Trout pattern minnows in Rapalas, Attacks, RMG Scorpions, Rebels, and Alex lures are great lures to try. 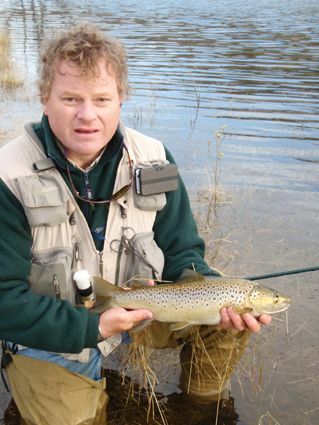 Try some of the larger lures down deep to search out the bigger browns. Spinning off the bank with Celtas, Tassies, Snowy Minnows and plastics is another method working in the lake at the moment. 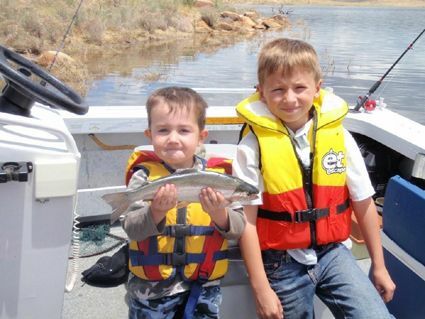 Joel Williams (left) and Ayden Senior with a nice rainbow taken from the boat on Saturday at Eucumbene. That is the first fish taken from this boat and certainly gave two young boys a thrill! Boat launching in Eucumbene is available at Old Adaminaby, The Dam Wall, Anglers Reach, Buckenderra. Jindabyne:- Jindabyne trolling reports have been scarce this week but there will be some good fish caught around the full moon this week. Mudeyes have been a key bait over the last week though Powerbait is still doing exceptionally well in Eucumbene. There have been some very good success stories this week out of Eucumbene. Mudeyes continue to be the pick of the baits. Reports of ten fish in a session have been common. My son and I were down at Buckenderra for 3 days over the weekend. Had a great time catching 25 fish overall and dropping 3; fishing was a tad slower than over the new years break when i was last down there, but overall definately was worth the trip. My son caught his first trout on a mudeye but unfortunately forgot to take a picture! Got caught up in the excitement! 20 fish were caught on mudeyes that you supplied and 5 were caught spinning with a mixture of tassies and snowy minnows. A vey special mention to Michael and Dave who have always been very helpful to me with their knowledge and tips, also, to the staff at Buckenderra Holiday Village for their great hospitality. Jindabyne has also been very good with Mudeyes with the Stinky Bay area a stand out. Powerbait and Gulp wil produce some good fish during the day. Try Hatchery, Curiosity rocks, Claypits, Stinky Bay, and Kalkite.